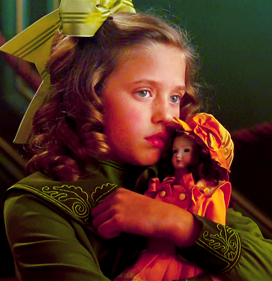 Sara Crewe in A Little Princess, clutching Emily. She is a glass doll. Until they’ve been greased with prints. Loved now by someone’s sticky hands. That plainly show where they’ve been. To be so easily abused this way. But fingers damp from moistened mouths feel none of this. Claiming it, for now, knowing later she must be relinquished. Before setting her back on display to be picked up again. She is a glass doll, slowly shattering. “Residue” is Magnificent Mayhem’s first published piece in Inkblots Magazine. Often writing free verse poetry in her spare time, her inspiration for this particular piece was taken from the similarities between how roughly a child may play with a doll or toy and our tendencies to treat people as property – succumbing to our selfish desires. This is an edited version of one of my pieces, selected to be displayed in November’s content. Thanks Inkblots and Typing Spots! Definitely recommend you head over there to check out the stuff that other aspiring writers are contributing, and even send in something yourself.